Venturing beyond the realms of traditional biometrics, we aim to profile or characterize individuals based on long-term attributes such as age, gender, ethnicity, body and personality type as well as transient attributes such as clothing, posture/gait, mood (or affect), social setting, level of engagement/fatigue, collectively referred to as soft biometrics. For this purpose, we use visual cues from cameras as well as behavioral and physiological cues from other sensors (eye movements, EEG, wearable devices). We are focusing in particular on the application of retail commerce. Businesses can gain immensely by identifying different sections of the population and understanding their buying behavior. For example, knowing what clothes people of different genders, age groups and ethnicities wear can enable fashion outlets to reach out to different target groups more effectively, e.g. through targeted advertising. Likewise, sensing affect and attention can help generate genuine and timely feedback to shops and service-based businesses as compared to the contemporary use of survey questionnaires. Using such approaches to assess customer satisfaction can help raise the overall quality of service. 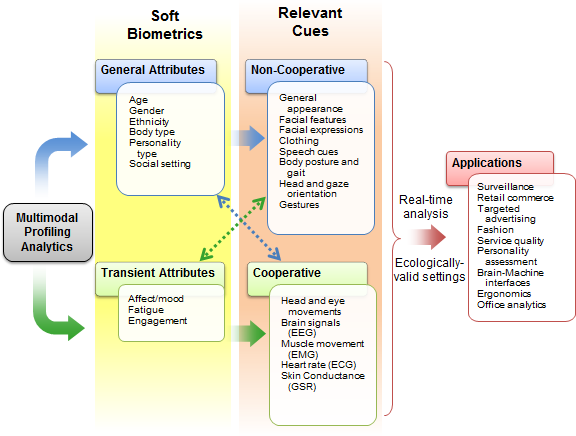 We consider both cooperative settings, where the monitored users assist the profiling process (e.g., through the use of wearable sensors), and non-cooperative settings, where the sensors are physically separated from the monitored subjects, who consequently may have little or no knowledge of the profiling process. Specifically, we employ multi-modal analytics for estimating the following profile attributes: age, gender, height and weight (body type), ethnicity and personality type, clothing, gait/posture, social setting, affect, fatigue, frustration, and engagement.